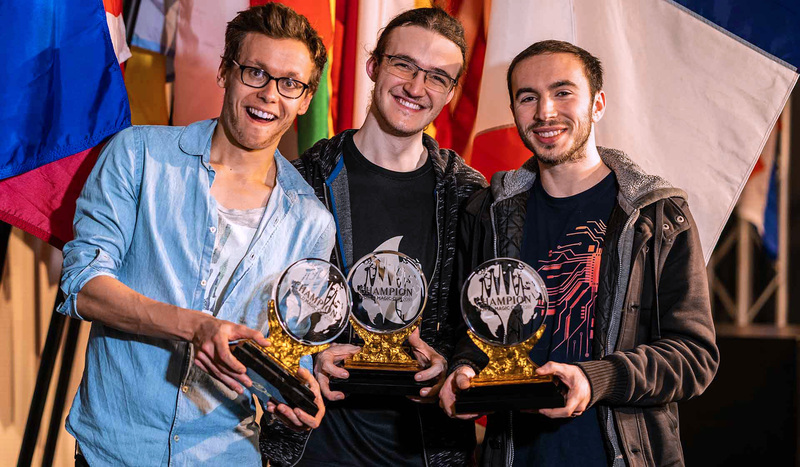 Team France—Jean-Emmanuel Depraz, Arnaud Hocquemiller, and Timothée Jammot—have won the 2018 World Magic Cup to win France its second title after five years! The hashtag for the 2018 World Magic Cup is #MTGWMC. Join the conversation. See the 2018 World Magic Cup as it unravels on the Magic: The Gathering Facebook page! Team France—comprising Jean-Emmanuel Depraz, Arnaud Hocquemiller, and Timothée Jammot—has gone the distance and secured a second title for the country, five years after Raphaël Lévy, Yann Guthmann, Timothée Simonot, and Stephane Soubrier first won the event in Amsterdam. Led by Depraz, one of the 32 players in the kick-off of the Magic Pro League, France’s journey to Sunday had only minor harrowing moments, as the team of France’s new era of Magic players cruised through the first day, and was one of the first four teams to secure their slot in the playoffs after winning the first two matches of their second stage of play on Saturday. Sunday featured epic showdowns against countries with World Magic Cup winning accolades. France first had to best Japan in the quarterfinals before dispatching Team Italy—who made it to the Top 8 for the fourth consecutive year—in a nail-biter series of matches that hinged on Hocquemiller’s final game and an utterly explosive Fight With Fire. In the finals they fought against Team Israel, where they secured two wins before the third match could play out in full, securing France their second World Magic Cup title. Congratulations to Jean-Emmanuel Depraz, Arnaud Hocquemiller, and Timothée Jammot on their hard-fought victory this weekend, and to France for taking top honors for a second title home! Only eight countries remain in the 2018 World Magic Cup. Hong Kong, Italy in their fourth consecutive Top 8, Japan, Israel, China, France, Australia, and Slovakia will all return Sunday starting at 9 a.m. local time (12 a.m. PT/3 a.m. ET/8 a.m. UTC) on Sunday to see who will take home the trophies and their share of $250,000. Tune in to twitch.tv/magic starting Sunday to see it all live. 32 countries will return to Day Two of the 2018 World Magic Cup to compete for their share of $250,000 and the trophies. Tune in to twitch.tv/magic Saturday at 12 a.m. PT/3 a.m .ET/8 a.m. UTC to see who will make it through to Sunday’s Top 8 playoff! Live video coverage of the 2018 World Magic Cup is hosted on twitch.tv/magic and begins Friday at 1 a.m .PT/4 a.m. ET/9 a.m. UTC.